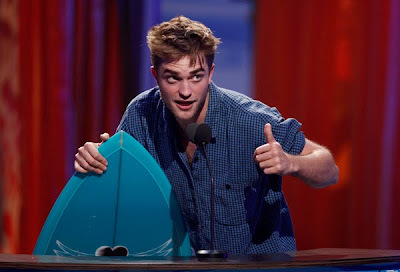 Yesterday on Sunday, August 9, the 2010 Teen Choice Awards took place at the Gibson Amphitheatre in Los Angeles. The show turned into a vampire love-in as the two sequels from the Twilight franchise (The Twilight Saga: New Moon, and The Twilight Saga: Eclipse) cleaned up in the film categories with twelve awards, while The Vampire Diaries was the big winner in the television categories with seven. Robert Pattison, Taylor Swift, and Justin Bieber each came away with four awards. Neither Swift nor Bieber were able to attend. Much like the Nickelodeon Kid's Choice Awards, the winners are usually dubious but popular choices. 105 winners were announced in several categories: film, television, music, sports and fashion. Winners were chosen by online voting, with over 85 million voters participating. The award ceremony will be telecast on Monday night at 8pm.